View or download map of the Sanctuary here. The Kate Palmer Sanctuary is regarded by many Jackson County naturalists and botanists to be the richest public woods in Jackson County for wildflowers. At the right time of spring (usually late April to early May), the woodland is carpeted with masses of Trout Lilies and Trilliums. Goldenseal, Golden Alexander, and Maidenhair Ferns come later as well as over 50 identified plant species. The Kate Palmer Sanctuary is one of the last places in Michigan to find Shingle Oak trees with their unusual elliptical leaves. Over 100 species of birds have been identified in the sanctuary, including Pileated Woodpeckers, Wood Ducks, and over 20 warblers. Sandstone Creek feeds the Grand River and is one of the only streams in southern Michigan able to support a Trout population. The creek dissects the sanctuary providing an attraction to birds and a spot to fish. Marked trails circle through the lowland woods near the creek. The sanctuary is the perfect size for snowshoeing. Parking for a limited number of vehicles is maintained. 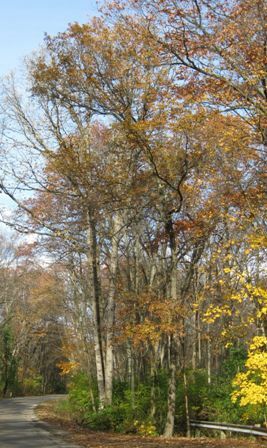 The upland woods are accessible by parking at the Trinity Lutheran School. Please inform the school when you enter the sanctuary from there. In1880 it was discovered that the area was underlain with fire-clay and coal. The pits from which the clay was taken are still in evidence on the west side of O’Brien Road. The sites of some of the coal shafts are marked by piles of disintegrated shale and springs which are still rising where the old shafts were located and now filled in. The last coal lease expired in 1924. The sanctuary area has remained undisturbed since 1926 when the Jackson County Audubon Society purchased the acreage. The money for the purchase was raised through donations from many well-known members of the community. The largest donor was Kate Palmer, born near Parma, Michigan in 1858. 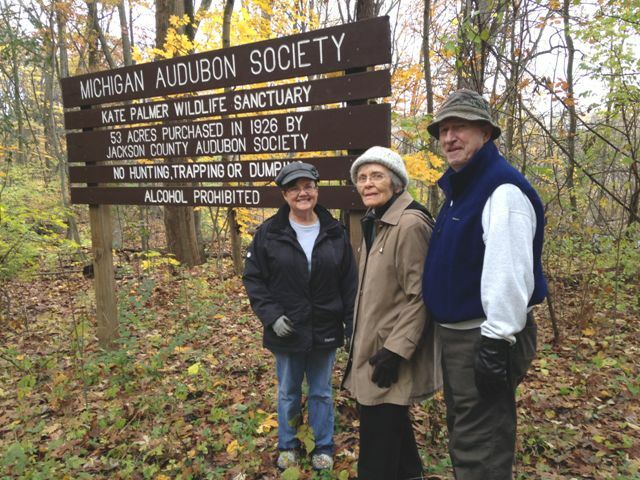 As a charter member of the Jackson Audubon Society, Kate was a proponent of the preservation and conservation of natural lands to be used as refuges for species pressured by increasing development. The Jackson Audubon Society maintained the sanctuary, put a trail through it, used it for their meetings and for nature study. When the society temporarily disbanded in 1941, the land was donated to Jackson Public Schools, so that it could continue to be used by teachers and students as a living laboratory in the natural sciences. Bob Whiting used the sanctuary as an outdoor ornithology lab during the 27 years that he taught at Jackson Junior College (now Jackson College). The Jackson High School Biology Club and Parkside High School used “Bird Haven” as it was known for bird-banding, the study of wild flowers, and an artesian well was tapped, allowing the public to get their drinking water from this well until the early 1980's. In 1960, Eliot Porter a nationally renowned photographer photographed the uncommon Cerulean Warbler at the sanctuary. In 1986, the land was conveyed to Michigan Audubon through the efforts of Jackson resident, Nancy Lapinski for safekeeping. She maintained it as a member of Jackson Audubon Society for 20-years. Jackson Audubon remains as steward, recruiting students and citizens to assist in annual cleanup activities.